Can you help make this vision of the ideal Wheelchair Friendly RPG Trailer a reality? Trying to build to build the ideal Wheelchair Friendly RPG Trailer. Will accommodate up to 6 people in wheelchairs for Therapeutic Recreation, Music & Recreation Therapy, Drum Circles, and Role-Playing Games. Heartfelt thanks to you for your support, and a public thank you for your donation on the gofundme.com page. For individual donations equal to $5 US dollars or more. $10+ GoFundMe & Twitter Thank you. For individual donations equal to $10 US dollars or more. $20+ Website List of Donor's. Public thank you as previous level, plus a listing on the RPG Research website's List of Donors to say thank you for your generous help in turning this vision into reality. For individual donations equal to $20 US dollars or more. $50+ Website & Social Networks Thank you. Public thank you as previous levels, plus a public thank you on the RPG Research Blog at http://www.rpgresearch.com/blog and the RPG Research Facebook https://www.facebook.com/RpgResearchProject and other social network accounts (Google+, Tumblr, etc.). For individual donations equal to $50 US dollars or more. $100+ RPG Research Status Update Video Thank you. As previous levels, AND a verbal thank you from Hawke Robinson, founder of The RPG Research Project, in the next RPG Research Project status update video (roughly monthly) on the RPG Research Youtube Channel http://youtube.com/rpgresearch For individual donations equal to $100 US dollars or more. $250+ Dedicated Thank you Video & Donor Placard. As previous levels AND your name mentioned in a dedicated thank you video on the RPG Research Youtube Channel , AND if fully funded added to the "Thank You" Donor Placard that will be in clear view on the inside of the trailer. For individual donations equal to $250 US dollars or more. $500+ Trailer Single Sign Thank you. For individual donations equal to $500 US dollars or more, and requires campaign to be fully funded. $1,000+ Trailer Visit Thank you. For individual donations equal to $1,000 US dollars or more, and requires campaign to be fully funded. $2,000+ Trailer Visit with Session Thank you. If fully funded, all donations of $2,000 USD or more includes all of the options from the lower donor levels, PLUS (if you wish) if able to visit you within that 500 mile radius from the trailer pick up route, I will personally run a tabletop role-playing game session for you and your friends (up to 6 players total) for up to 6 hours, as a huge thank you for making this a reality. If you are outside of the 500 mile reach of the route, if all funding costs are met and you wish to donate additional funds to cover the additional travel costs to your location, I would be happy for the opportunity to come to you, calculating roughly 10 miles per gallon for gasoline (roughly $3.50/gallon currently) for the distance round trip. For individual donations equal to $2,000 US dollars or more, and requires campaign to be fully funded. Any additional funds beyond the campaign base goal, after travel and incentive costs, will be applied entirely toward paying down the principle on the loan balance for the rest of the cost of the trailer, so anything beyond the minimum goal will be very helpful as well. 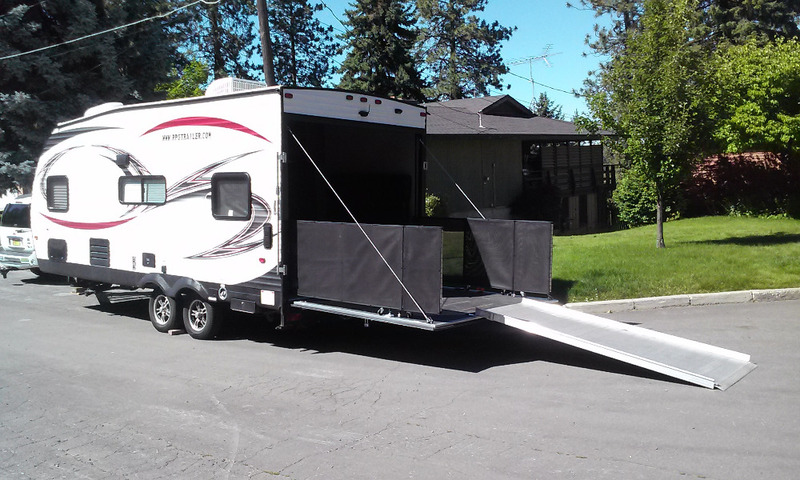 The current trailer can only accommodate 2-3 people in wheelchairs, and is difficult to deploy the ramps. The Ideal version has a lower ride hide so can be rapidly deployed, has a better internal layout with level floor (current one has slope), will have wall sliders to make wider so can accommodate 6 people in wheelchairs for activities (current can only handle 2, or a third squished in), and would have fully wheelchair accessible bathroom and shower (current can't be unfortunately). I've done what I can on my own, and will keep doing so, but if you believe in what we're doing through the non-profit RPG Research ( http://www.rpgresearch.com ), then consider helping us make things better for people with wheelchair accessibility needs. If at some point RPG Research, a 501(c)3 non-profit research & community services organization, can afford to maintain, license, and own it, I will donate the entire trailer to RPG Research. Until then, I own it to cover all the costs that RPG Research couldn't afford on their own, but I let them use it any time needed for any programs. 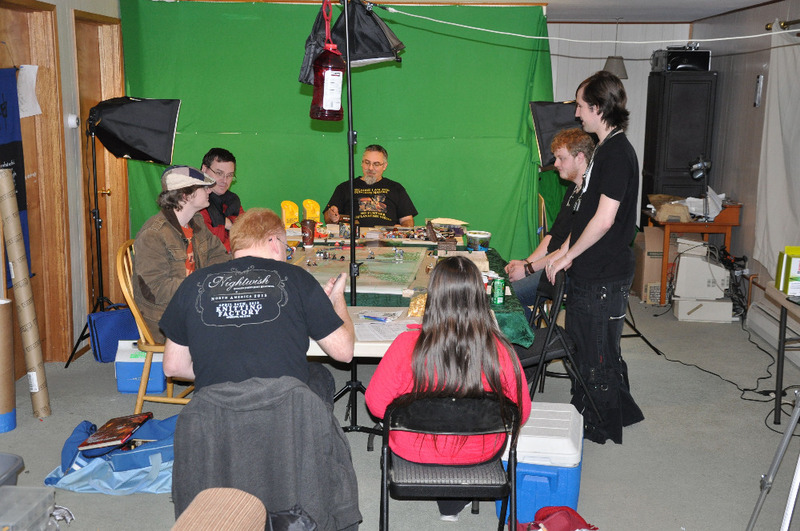 As part of aloose group of volunteers, I research the effects of all forms of role-playing games, and also volunteer, design, and provide, for FREE, services for special needs populations throughout the greater Spokane, Washington area. This includes using role-playing games (RPGs), recreation therapy, music therapy, and other services that help people. I run both regular and adapted games, for both regular and special needs populations. Drum Circle program used for Summoning to Battle Royale program by RPG Research for MDA. 2017. 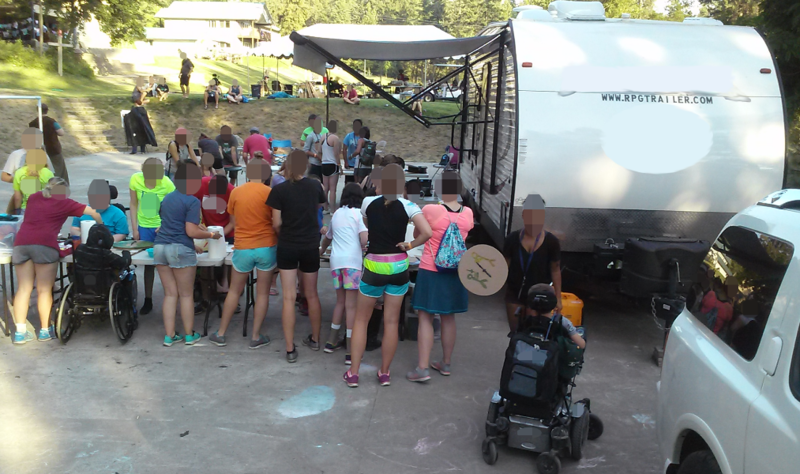 The goal of this fund raiser is for the down payment to build a wheelchair friendly trailer. This will help extend the reach of the The RPG Research Project, and as a Recreational Therapist, improve the affordability of providing services throughout the Northwest and North America. Setting up Prototype RPG Trailer at MDA camp. The prototype can only handle 2-3 wheelchairs, and takes over an hour to deploy with 2-3 people, the ideal trailer will accommodate 6+ wheelchairs, and take less than 15 minutes to deploy with only 1 person to deploy. You can help with the research, and helping with the trailer increases the locations that research can affordably take place. You already know the many great benefits from RPGs. The RPG Trailer will make it much easier to provide free RPG sessions using tabletop, computer-based, and live-action (LARP) role-playing games for those who need it most, but have the greatest difficulty being able to participate. 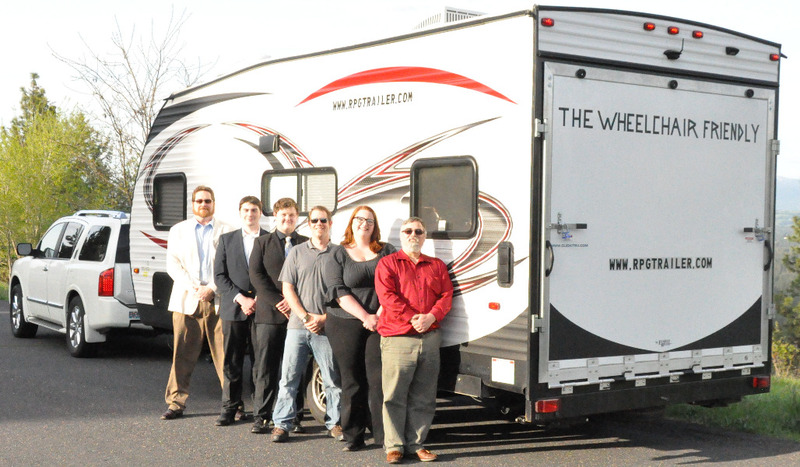 There is 30+ years of research on the many benefits of RPG , and coupled with the Recreation Therapy profession, the RPG Trailer will help make it possible for people that need RPG the most, who have the greatest trouble getting to participate in RPGs, such as living in rural areas or in a wheelchair, to experience the joy and benefits of RPGs. The RPG Trailer will also help with advocacy and education regarding RPGs, by being a very visible symbol, triggering opportunities for discussion about the truth, and disproving the myths, about RPG and gamers. Hawke Robinson presenting RPG Research at Seattle Children's Hospital , for Recreation Therapists Conference. 2015. 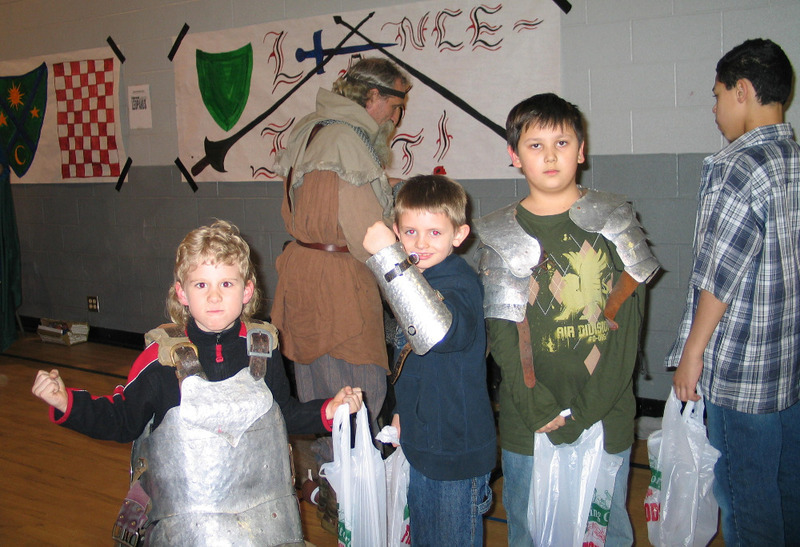 Many schools, facilities, organizations, and professionals throughout the world, have found that using role-playing games are highly effective as an instructional modality for increasing student engagement and retention in many topics. The RPG Trailer will make it possible to arrive at your educational institution, providing RPG sessions for students, and/or provide traning to educators, enabling students to engage more fully in the learning process, leading to better retention, and many other benefits. Shield customization. RPG Research LARP program for MDA . 2017. Utilizing a multidisciplinary approach, including Recreation Therapy (RT) / Therapeutic Recreation (TR), psychology, and neuroscience, using relevant evidence-based and theory-based approaches, based on well-established professional standards and RT/TR methodologies to provide intervention program plans using 30+ years of research on the various forms of role-playing games as an intervention modality to achieve clients' specific therapeutic goals. 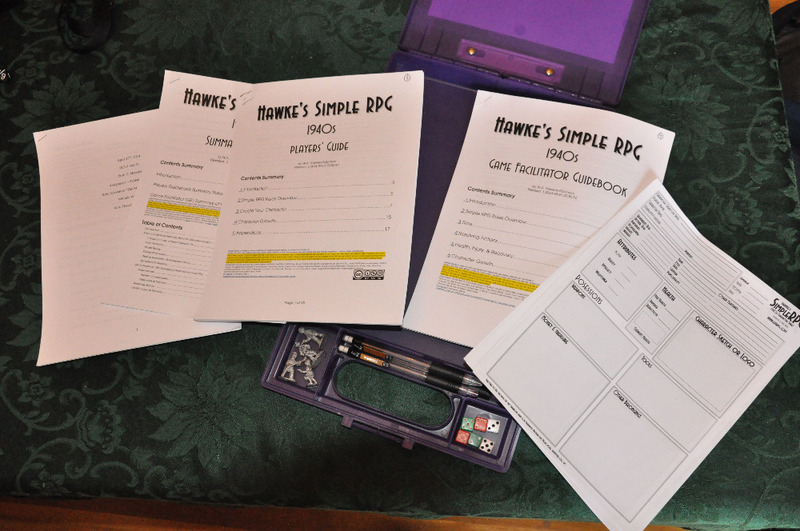 The RPG Trailer will make it possible to provide RPG sessions for your clients directly, and/or provide training to health professionals in how to design and implement regular and adapted role-playing games to facilitate achieving your clients' goals. RPG Research's Hawke Robinson at WorldCon 73. Gaming for Education & Therapy. 2015. 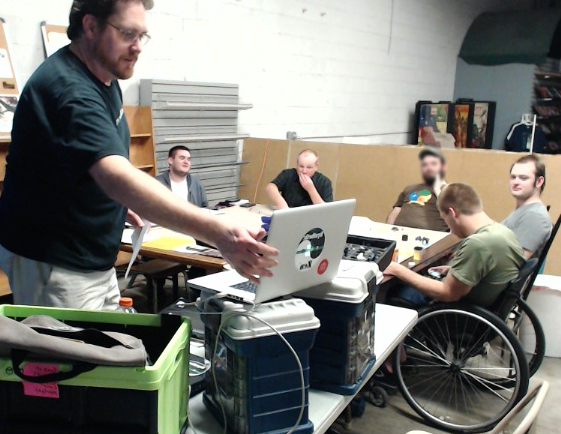 The services primarily include using role-playing games of all types: tabletop, live-action (LARP), computer-based, and interactive choose your own adventure. My volunteer work also includes other Therapeutic Recreation (TR) and music therapy related services as deemed best for participants. Drum Circle Facilitation Workshop by RPG Research. Includes adaptive equipment & considerations. 2017. 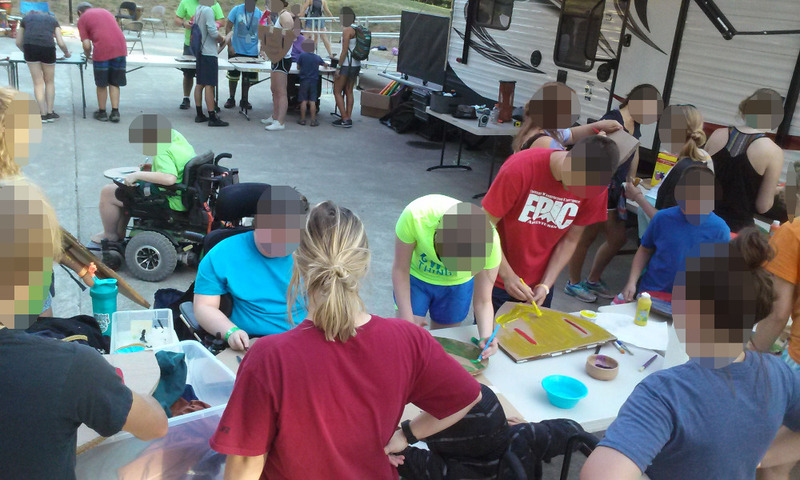 The services are being provided for free to those in need, that are based on proven Therapeutic Recreation methods to help achieve education and/or therapy goals for individuals and groups, primarily using non-adapted, and adapted role-playing games. Fantastic Fun For All Extreme-Medieval Sports Lance-A-Lot Joust by Hawke Robinson / RPG Research, for Northeast Youth Center. 2007. * Autism spectrum toddlers through adults (ASD / PDD), Asperger's, ADD/ADHD, etc. * Those residing in rural and underserved areas. RPG Research, Fundraiser for Children's Miracle Network . Extra-life. 2015. See the http://www.rpgtrailer.org website for more details, photos, videos, and other information about the trailer, research, presentations, and other useful information. Late-night RPG, with Cerebral Palsy participant. 2015. WHAT IS THE FUND RAISER'S BACKGROUND? My name is Hawke Robinson . I had a successful career as an executive in technology industries. Residing in Spokane since 2004. I volunteer at many locations, using Recreation Therapy (RT) methodologies. I have been involved with role-playing games since 1979. I have been volunteering extensively for many years. I am registered with the Washington State Department of Health as a Recreation Therapist #RE60526204 . I am also currently a student at Eastern Washington University (EWU) working on degrees in Recreation Therapy, Music Therapy, Neuroscience, & Research Psychology. I have completed the Mental Health First Aid certification program. After completing two internships (recreation therapy and psychology), I am planning to sit for the NCTRC CTRS (Certified Therapeutic Recreation Specialist) exam. I also plan to continue onward toward graduate and post-graduate degrees. I am a member in good standing of the Washington State Therapeutic Recreation Association ( WSTRA) & the American Therapeutic Recreation Association (ATRA) . * Senior citizens at assisted living and long-term care facilities in Eastern Washington, Northern Idaho, Northern Utah, and others. There are already many individuals and groups throughout Eastern Washington & Idaho, as well as Seattle, Tacoma, and other states, that have indicated they are just waiting for me to be able to provide these sessions as soon as I can find the means to do so. After significant research it is clear that the best way for this to be accomplished is by building a wheelchair friendly trailer as a mobile facility. The minimum goal covers the minimum down payment and transportation costs of a portable office (trailer) that is designed from the ground-up to be more than just wheelchair accessible, it is designed to be wheelchair friendly. It also includes the costs of the campaign to receive donations. This trailer would completely replace the need for the expensive offices in different cities/towns, or the various insufficient facilities (stores, schools, churches, community centers, etc.) that are inadequate/sweltering/uncomfortable/noisy and/or not wheelchair friendly, and/or not friendly or feeling safe for those with special needs. This trailer will make it affordable for me to provide sessions in rural areas that are completely lacking any facilities. After the down payment, the monthly cost of the trailer is less than my monthly office costs in Spokane. 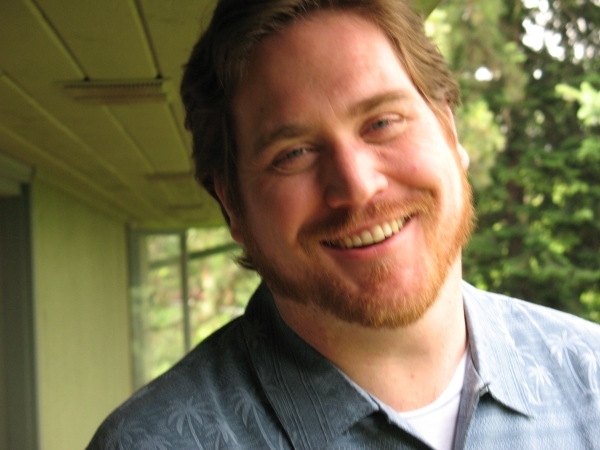 * View my 90 minute presentation video at Seattle Children's hospital from April 2015 for the Washington State Therapeutic Recreation Association with a comprehensive overview of role-playing games, and more information about how role-playing games can be very beneficial to participants. My presentation was certified by the American Therapeutic Recreation Association for Continuing Education Units (CEUs). 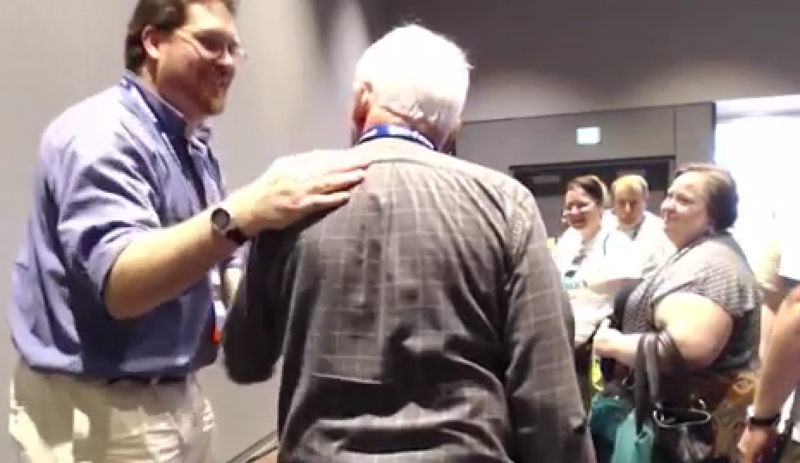 * Video & Audio from Hawke Robinson speaking at WorldCon 73 / Sasquan. It has become increasingly clear that role-playing games are an excellent modality for intervention using therapeutic recreation / recreational therapy methodologies to meet the needs of specific clients' development and rehabilitation goals. Please donate today and help spread the word! * Recreation Therapy adapted RPGs to help Autism Spectrum Disorder (ASD) toddlers, youth, & adults. * Brain Injury (stroke, TBI, etc.) recovery program, presentation. The trailer will support all forms of role-playing games: tabletop, live-action (LARP), interactive choose your own adventure, and computer-based. It will accommodate up to 6 participants in wheelchairs or up to 10 non-wheelchair seated participants. Once this funding goal is achieved, it will take the manufacturer approximately 9 to 16 weeks to build the trailer. The more money I can raise for this program, the more people I can provide free sessions to across North America. Many thanks for the kindness and support! The reasons why we need the trailer were illustratively driven home by one participant especially. 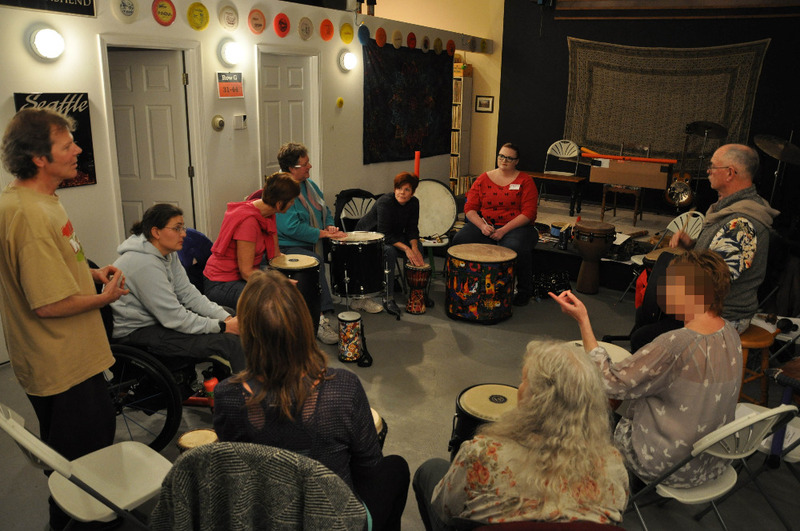 We had one participant in a wheelchair that also had hand paralysis, but discovered much to her pleasant surprise, she can use them excellently not only with the number of adaptive instruments we had, but also on the djembe, ocean drum, and a number of others. Many now inspired to spin up regular circles and groups, and want us to help them do so at various facilities around the state. Couldn't have asked for a better first try! Thank you so very much Bob Rice of IndieAirRadio.com for hosting this event! IndieAirRadio helped raise nealy $200! Heartfelt thanks to you for your support, and a public thank you for your donation on the gofundme.com page. A thank you on the GoFundMe website and listing your name on the RPG Research website's List of Donors to say thank you for your generosity. As previous levels, plus a public thank you on the RPG Research Blog website, Facebook.com/Rpgresearch, Google+, and other social networks. As previous level PLUS your name mentioned in a video posted on the RPG Research Youtube Channel youtube.com/rpgresearch. As previous level, PLUS if successfully funded, your name will be listed on a Donor Placard in plain sight inside the trailer. As previous levels PLUS your name listed on one sign or painted with other donors on outside of trailer in plain view near logo. All previous level awards, PLUS if fully funded and you are within 500 miles of travel route to pick up trailer, will meet in person to thank you & see trailer. All previous levels PLUS if fully funded, will meet you in person and run a game for you & up to 5 friends in the trailer for up to 6 hours! I understand how much fantastic benefit such a project as this would provide. All Synthetic Zen music royalty and similar checks are donated directly to the RPG Trailer Gofundme until it is funded. October 6-8, 2017, Spokane, people at Fannex.us convention donated this amount total in our Donation Jar. Thank you for your support! The 2 hour Introduction to Drum Circle Facilitation Workshop went exceedingly well. Participants asking for more. They generously donated nearly $200 towards the Wheelchair Friendly RPG Trailer! http://rpgtrailer.com The reasons why we need the trailer were illustratively driven home by one participant especially. We had one participant in a wheelchair that also had hand paralysis, but discovered much to her pleasant surprise, she can use them excellently not only with the number of adaptive instruments we had, but also on the djembe, ocean drum, and a number of others. Many now inspired to spin up regular circles and groups, and want us to help them do so at various facilities around the state. Couldn't have asked for a better first try! Thank you so very much Bob Rice of IndieAirRadio.com for hosting this event! Thank you so much to those that donated, we can't thank you enough for your generous support!